Just as debugging should be thought of as a vital part of every development cycle, on-device debugging should be part of any effective testing regimen. Although much can be accomplished using emulators and an IDE, applications often behave differently when running on hardware, and features such as Barcode scanning are impossible to test without the use of physical hardware to perform the scan and acquire the data. Chrome's Web Inspector - works with Android KitKat and higher, is easy to set up, and offers screenshots and other nice extras. Weinre - is a node.js application that can effectively test most apps running on Android Jelly Bean as well as Windows Mobile/CE devices. 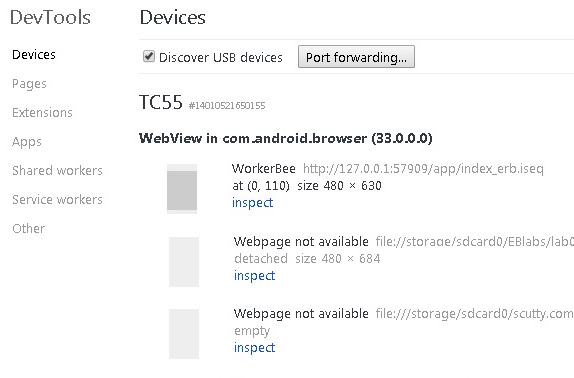 Remote Debug Inspector - works with Windows Mobile/CE devices that use the Zebra Webkit. Requirements of the development host vary based on the target device and its OS platform. General requirement guidelines are listed below. Platform-specific requirements, if any, will be listed in the section that describes the individual debugging tool and/or method. If you're building an Android app and have a device with Android KitKat 4.4 or higher, Google Remote Debugging is an alternative to Weinre that's a bit easier to install and offers some great visuals for testing, debugging and fine-tuning your app while it's running on the device. 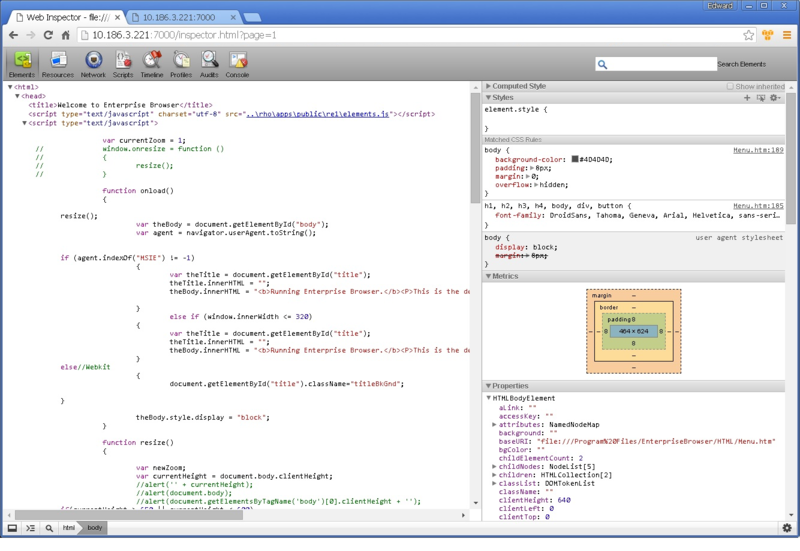 Google Remote Debugging works with native Android apps that use WebView as well as purely browser-based apps. It includes live screencasting from the remote unit to the development host, and supports port forwarding and virtual host mapping in case your device needs to access a development server. The app's <DebugModeEnable> tag contains a value of "1"
Before continuing, check that the <DebugModeEnable> tag in the app's Config.xml contains a value of "1" (see the Config.xml Reference for details). Edit that file (if necessary) and return here, or continue now and edit the file later. Open a browser window and enter 'chrome://inspect' in the address bar. You should see a screen similar the one above. 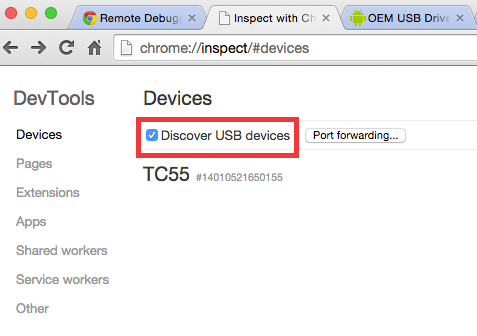 Check the "Discover USB Devices" checkbox. The mobile device appears along with an alert on the device. (If no devices are visible, please refer to the Connections section of the Enterprise Browser Setup Guide). Linux- and Mac-based developers can skip to the next step. 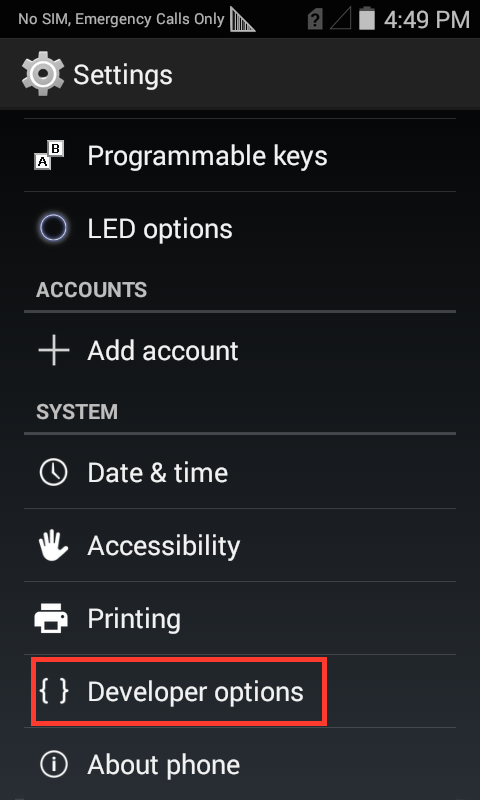 Developers on Windows must install a USB driver to make a USB-attached Android device visible. Please refer to the Connections section of the Enterprise Browser Setup Guide) for that procedure. To learn more about debugging with Chrome, please refer to the Google Chrome Dev Tools Tutorial. This section of the guide follows a 14-minute Weinre webinar and uses the Barcode Example app from that lesson for all of the examples in this guide. You're welcome to download the app and follow along, use your own app, or simply play around with the APIs and code snippets. Note: Admin/sudo privileges are required to install Weinre. Weinre is a Node.js application and is delivered via a Node Package installed with the npm command. 1. Download node.js from the project's /release folder. For more information about installing and configuring Weinre, please refer to the Weinre installation site. IMPORTANT: The target device must be on the same Wi-Fi network as the development host. When launched, Weinre must be bound to that network using the boundhost parameter (see below). Launching without this parameter will bind Weinre to the localhost, making it inaccessible from the device. 4. 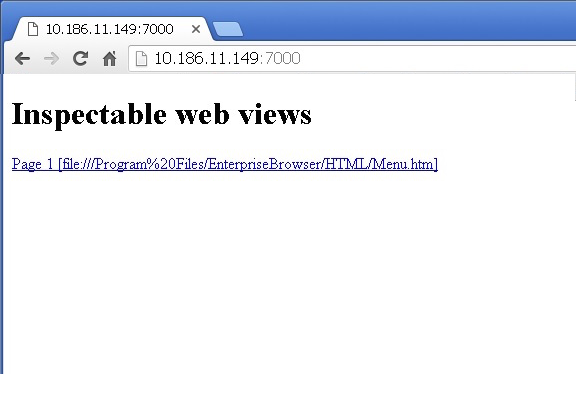 Using a browser, open the address and port provided by Weinre. 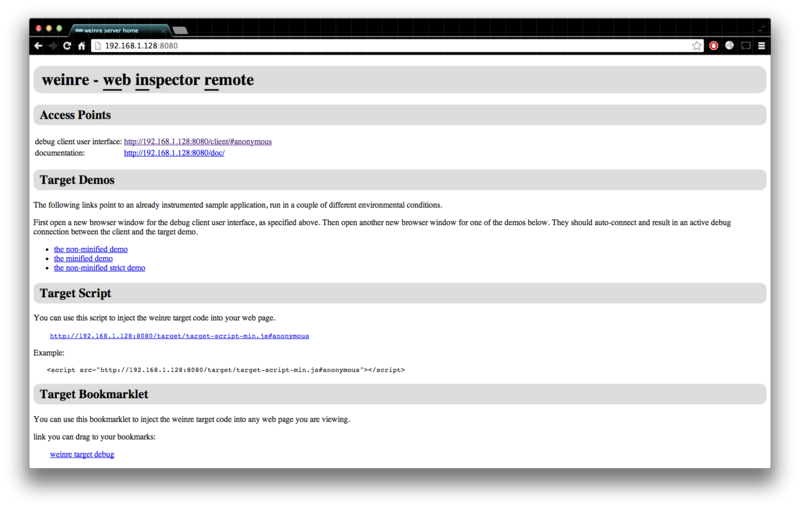 If all has gone well so far, the browser is displaying the Weinre Inspector Remote console. In the section labeled ‘Target Script,’ there's a string that contains a URL with the dev host's local IP address and port number, plus the name and path of the script file that Weinre needs to communicate with the target device. 5. Copy and paste the example script string (above) into the barcode_enumerate.html file (or your corresponding app file). 6. Copy the URL string referenced earlier and use it to replace the example URL. Be sure to leave the quote marks on either side of the URL. The inset image is a screenshot from the target Android device that’s being displayed by an app called Droid@Screen . This useful screencasting tool uses USB and ADB to stream screen shots to the development host. At this point, the app can be inspected as with the web inspector of Chrome or any other tool. 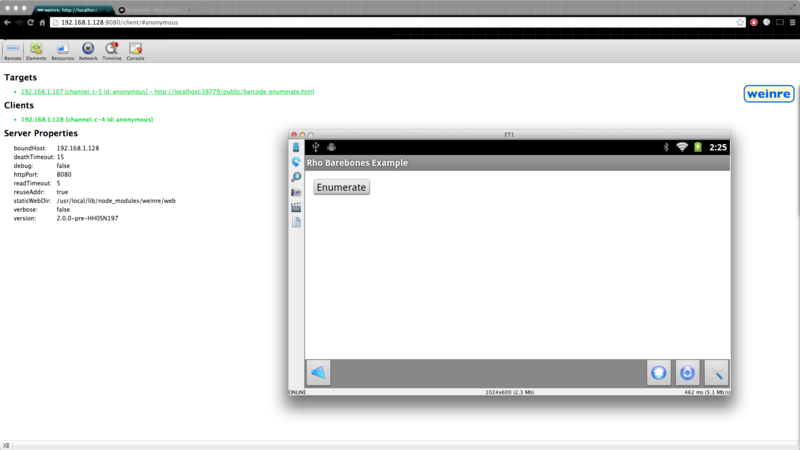 The Elements tab shown below demonstrates two-way communication between the device and the development host. Clicking on an element in the HTML will cause that element to be highlighted on the device’s UI. One of the most versatile components of Weinre is its Console. Not only does it offer classic capabilities such as device visibility and monitoring during operation, but the Weinre Console also can access all of a device’s hardware features, issue commands and report how the device reacts. Here’s another important benefit of the Weinre console. Notice that when the barcode callback handler function is executed, we are using the form console.log(e), where e is the callback return object. This allows us to inspect the object right in the console. It also simplifies validation because we see that it contains a barcode property and a status property, exactly as described in the Barcode.take( ) method description. Alternative means, such as adding code for outputting to a log and then searching and retrieving the information from the device, can be time-consuming and error-prone. Several other tabs in the debugging UI can be quite useful. More information about Timeline can be found starting at 25:10 of Zebra’s Front-End UI Optimization Webinar. This one-hour video contains useful information about detecting re-flows and other common problems that can bring mobile apps to a crawl. The Remote Debug Inspector tool is for debugging apps running on Zebra Windows Mobile/CE devices that use Zebra Webkit. Remote Debug Inspector installs on the device and requires a new tag in the Config.XML of the target app to make it work with desktop Chrome. 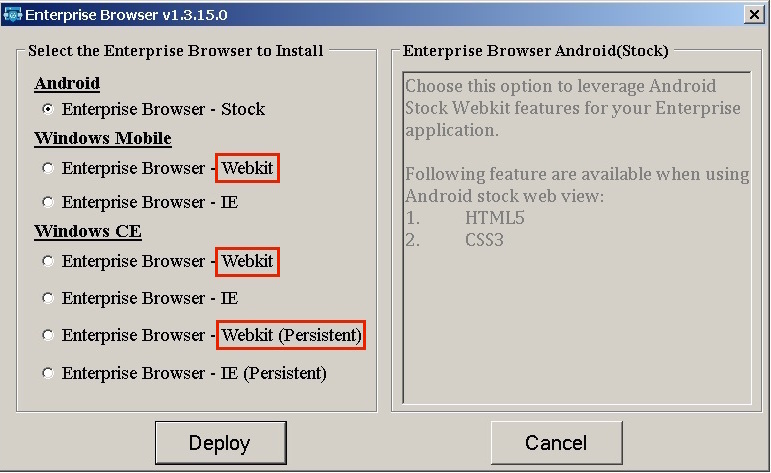 Enterprise Browser device installer showing Webkit deployment options. 1. Download Remote Debug Inspector tool. 2. Copy the downloaded "inspector.CAB" file to the device. 3. Execute the file, which will install into a folder called /inspector on the device. 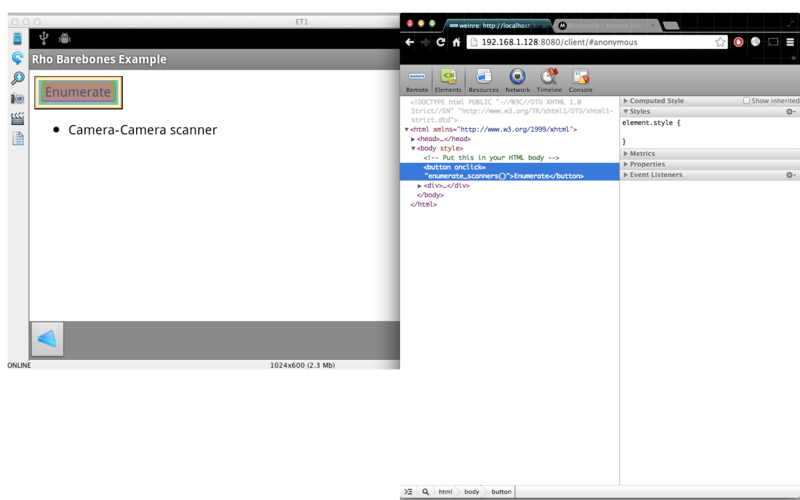 Notice that the <RemoteDebug> section is inserted after <HTMLStyles> and before <SIP>. Also note that we're using the default values for ResourceFiles and ServerPort. If these are changed, be sure to make the corresponding changes in the next steps. 5. Note the IP address of the target device (Wi-Fi Settings >> Wi-Fi Driver Settings). It must be on the same subnet as the development host. 6. Launch the Enterprise Browser app to be tested. This panel works in much the same manner as those of Weinre and Chrome Web Inspector (click on any image to enlarge).